International rates apply outside the U.S. This video is a compilation of horses worked during a Round Corral Communication Clinic. Brandon clearly identifies cues to watch for, what they mean, and how to use the horse’s herd behavior to embed the training into the horse’s mind. He shows you and the horse’s owner how to better communicate by mentoring their own session in the round corral. The content of this video is not staged, but shown with horses that are problematic, young, or dominant. 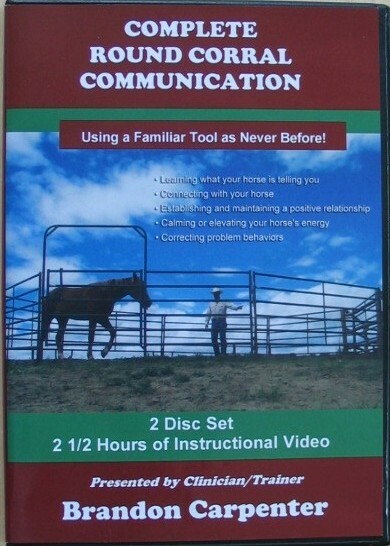 Brandon gives you the tools to communicate not just physically with your horse, but mentally and emotionally as well. What sets this apart from most roundpen work, is that the horses are not run until tired to get a desired response. The horses are worked based on the behavior they display. Each horse is handled as an individual in order to communicate with them quickly and effectively. You will learn how your personal energy affects your horse and how to control and use it to build a better relationship. A life-long horseman, renowned trainer, clinician, and former Montana game warden, Brandon presents this technical packing video for your instruction. He shares 2 1/2 hours of practical information from what type of rope works best, to saddles and saddle fit, to how to easily throw various hitches. Brandon teaches you the same skills he uses while traveling the rugged back country wilderness of the American Northwest. His presentation style makes the material easy to follow and duplicate. All tolled he offers 11 different hitches or loads. This in depth portrait of packing gives you the essential skills to successfully pack horses and mules into rugged wilderness areas even if you are a beginner. Seasoned packers can learn a few tricks too! Training your problem or young horse to trailer. This video demonstrates how to quietly teach a problem horse or young horse to load quietly and easily. Brandon loads a young problem filly into a large horse trailer that the owner had taken 5 weeks to load only once previously using force. Within just a few minutes Brandon has the horse loaded and unloaded several times. He then takes her to a small two horse trailer and again within minutes has her loading and unloading willingly. Another young filly and a young gelding are also loaded and unloaded in a stock trailer and again into a two horse trailer for the first time. There is no dragging or forcing the horse to teach trailer loading. Techniques are explained and problem situations discussed and corrected to enable you to successfully teach your horse to load. This is a must have instructional video for anyone wanting their horse to load itself.